Sharp and high-quality colour output with new PxP™ toner. Excellent productivity at 20/25 ppm in both colour and B/W. Unique internal finisher & punch unit. ​The high-performance Aficio™MP 2550 takes office productivity to a whole new level. Entirely custom-made, these multifunctional all-rounders unite a variety of functionalities to streamline your workflow. Furthermore, you obtain the cutting-edge strengths Ricoh stands for: ease of use, high productivity and state-of-the-art document management. 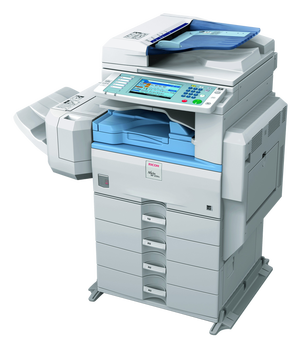 With these highly advanced systems you are prepared to meet any modern office challenge.